Wow! What a great weekend! Beautiful mountains, nice weather, and awesome competition! The drive up to Denver was a little bad due to a LOT of rain and bumper-to-bumper traffic from Pueblo to Denver, but it was still an awesome time. I was able to meet some very cool people and the events were so much fun to participate in. The Rocky Mountain events are HUGE compared to my local events in West Texas. Even though these two events were just normal local events for them, it was like attending a National Tour for me. They have the big timing display, so you can see what your time is as soon as you cross the finish line, and they also have announcers that comment on everyone's runs during each of the four heats. During the Street Modified battles on each day, the announcer's commentary was especially entertaining, as I was being called "The Six Shooter from Texas who brought his Big Guns!" The venue at the Denver International Airport is a very large concrete parking lot, and although we didn't get to use the whole lot, the area we used for the courses was still much larger than anything I'm used to in my region. The courses on each day were pretty fast and wide open (similar to a Nationals type of course design), but Saturday's course had two very tight hairpin turns that required downshifting to first gear (definitely not my favorite thing). The competion in Street Modified was very close. 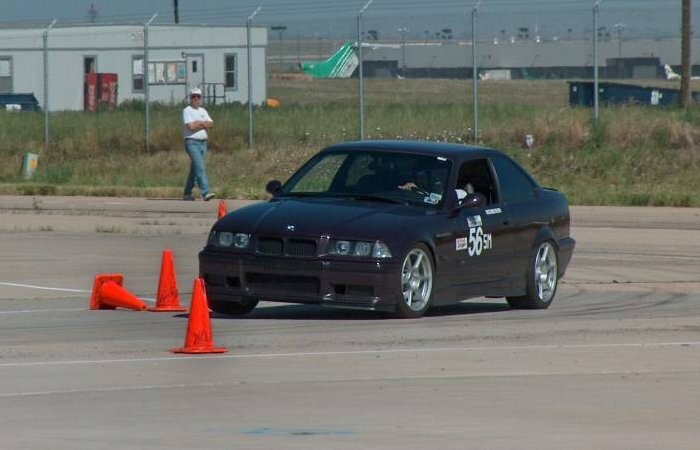 There were two other '95 M3s (driven by Michael Feldpusch and Doug Young) that I was closely competing with, and even though my car wasn't as "prepped" as the other two (both were on Hoosiers, a lot more negative camber and Michael's car even has the highly sought after 3:38 rear diff), I was still able to take the win on both days... but just barely (only 0.095 seconds on Saturday and 0.209 seconds on Sunday)! I'll definitely be returning for more Rocky Mountain events next season!